Hey, lovelies! I hope you all had a great labor day weekend. 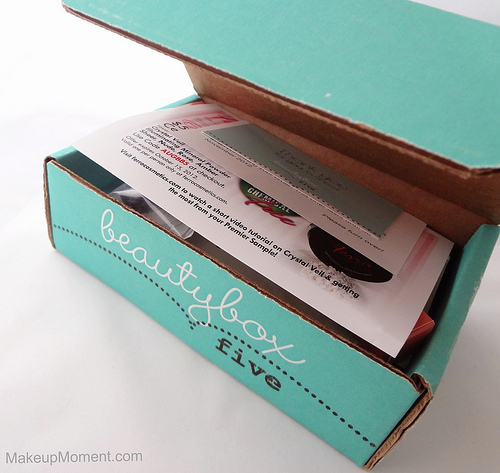 I recently got the opportunity to try Beauty Box Five-a monthly subscription service where you receive an assortment of 4-5 beauty samples each month, delivered right to your door. There are three membership options to choose from. The first one is a recurring monthly fee of $12, then there is a quarterly subscription option where it would only cost $10 per month (saving $6), or one can go for the yearly $100 fee (saving $44). Also, if you refer five friends to Beauty Box Five with your personalized referral link, you get one month free. That's pretty awesome! Now, let's see what I got in my beauty box! 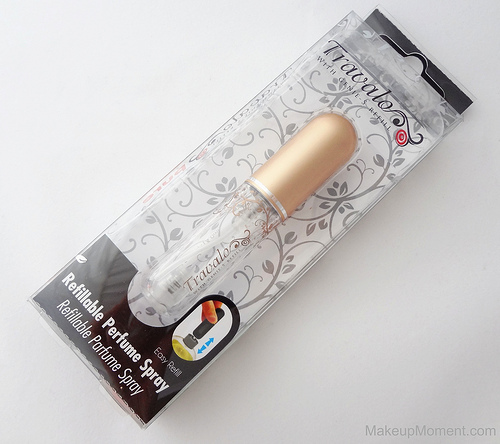 Travalo Refillable Perfume Spray: I am a huge fan of travel-friendly items, and this refillable perfume spray by Travalo is brilliant! It's so easy to use, too. Just remove the spray nozzle from your favorite perfume bottle, and pump in the liquid through the opening on the bottom of the Travalo spray bottle. It's that simple. Now, bringing along my favorite fragrance is going to be a breeze. This product is definitely one of the highlights in the box, for me. 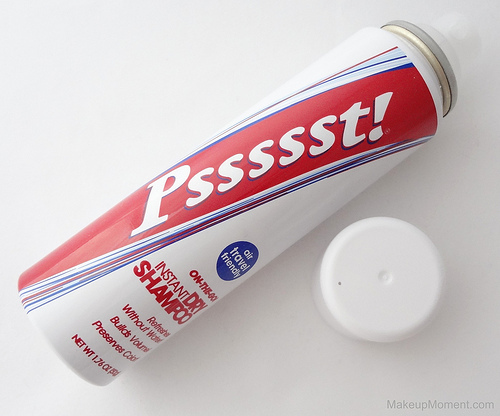 Pssssst! Instant Dry Shampoo: My roots get super oily so this dry shampoo is a real treat for keeping the oil at bay for a few days extra, in between washings. It also helps eliminate odor and boost volume, too. I have never tried dry shampoos before and I was really surprised at how simple this product was to use. I shake the can, hold the spray can a few inches away from my root/scalp, spray, rub it in, and style as usual. I am especially fond of the fragrance. It has a lovely fresh, and clean scent. I can't believe that it has taken me this long to try a dry shampoo. I am going to incorporate this into my hair care routine from now on. It's a very useful product to have-especially for oily hair. 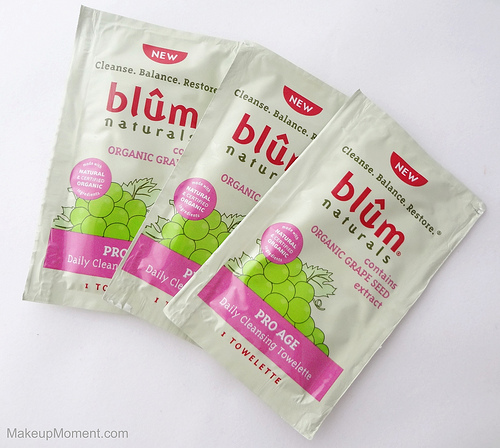 Blum Naturals Pro Age Daily Cleansing Towelettes: I enjoy trying out new cleansing wipes and it was nice to see these cleansing towelettes included in the box. The Pro Age Daily Cleansing Towelettes are infused with antioxidant-rich, grape seed extract. They are made with certified natural and organic ingredients, and are also paraben free, alcohol free, hypo-allergenic, PH balanced, and not tested on animals. I have already used all three towelettes that I received and I really enjoyed them. The towelettes are very gentle on my skin and they do a great job at removing my face makeup. They also don't leave behind an uncomfortable residue, either. My skin is as soft as ever after I use one towelette. I am going to purchase a packet of these really soon. 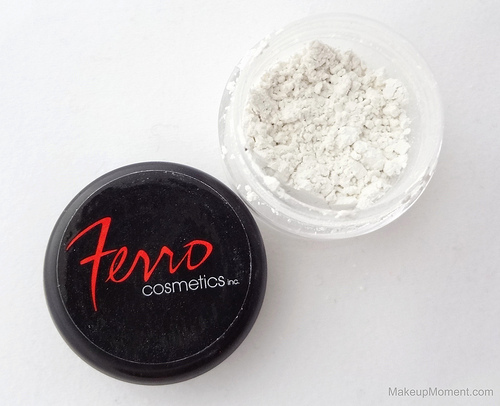 Ferro Cosmetics Sheer Crystal Veil: This sheer mineral powder is meant to give the skin a subtle luminous, dewy glow. It can be applied on cheeks, brow bone, and even the body. I applied a bit of the powder on the areas of my face where I wanted to highlight; my cheek bones, and the bridge of my nose. The parts where I applied this powder did in fact give off a luminous glow. It looked very natural and the glow stayed in tact all day, too. A little bit of product goes a long way so I am sure this sample size will last me a good while. Also, included in the box was a $5.00 Ferro E-Gift Certificate which is good towards a full-size purchase of one of the four crystal veil illuminating mineral powder shade options. Love! 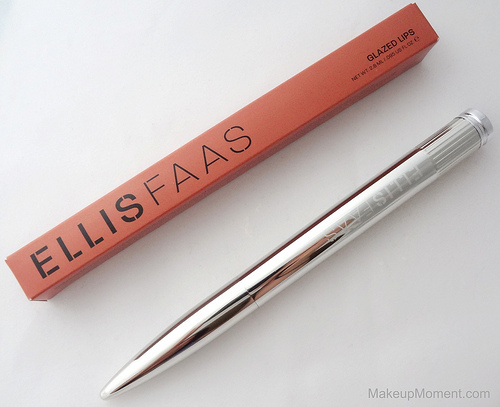 Ellis Faas Ellis Lips Glazed Lips in L305: How cool is the pen-style packaging of this gloss? It's out of this world! I really like the brush applicator. The bristles are super soft, and it applies the gloss beautifully. Now, I normally don't go for burnt/rusty orange lip shades like this one but, wow. I love it! It's a flattering color, and very autumn-esque. I like that the gloss is not super sheer. It produces just the right pop of color, that doesn't look overdone. 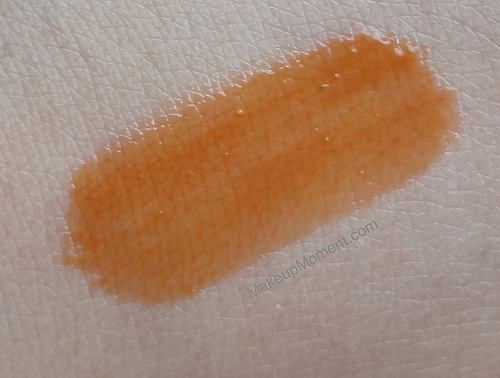 The texture of this gloss is probably one of the best I have ever come across. 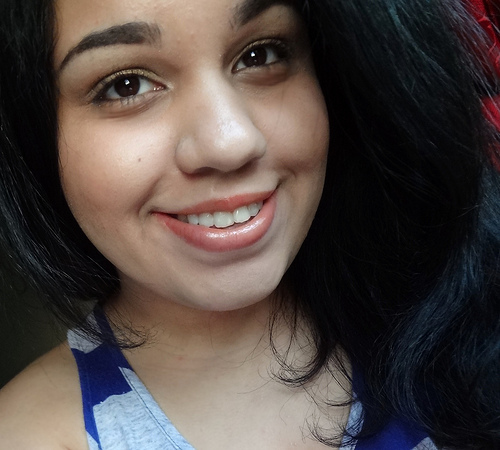 It's unbelievably smooth and feels pleasantly lightweight on the lips. This gloss is a full size, which originally retails for $35! I am interested in exploring the other shade options available. I may be able to soon because inside the box was a 15% off discount code on Ellis Faas products, on the Ellis Faas website. 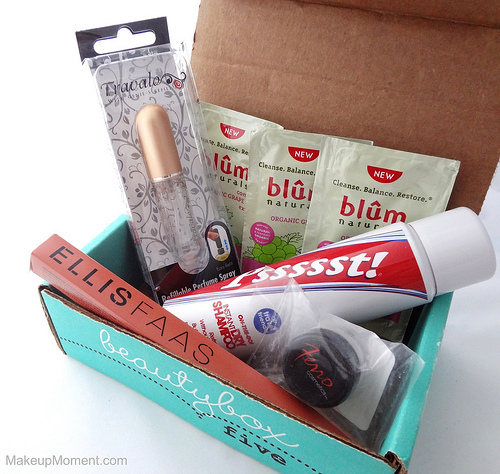 Overall: I am very impressed with my Beauty Box Five box. I appreciate the assortment of deluxe and full sizes, and I am happy to say that I enjoyed every single one of the items I received. I am definitely planning on subscribing to Beauty Box Five in the near future. The brands featured in this post are ones that are new to me and now thanks to this box, I have taken a real interest and have become familiar with new products that I probably wouldn't have thought of trying on my own. Gotta love discovering new items! What do you all think of Beauty Box Five? Disclaimer: I received the products mentioned in this post (free) for review purposes only. I am not being compensated for this review and as always, my reviews are honest, never influenced, and my own. Exciting! 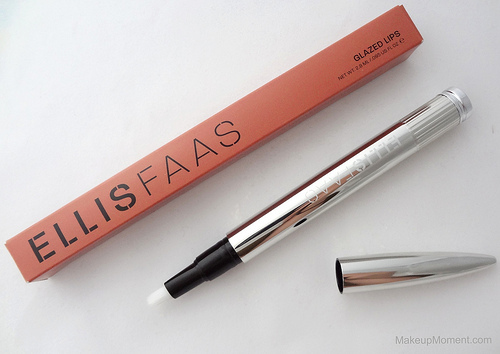 It's awesome you get to try the Ellis Faas lip glosses!!!! :D That's pretty amazing for $10! Looks like an interesting box. I'm excited to see what products you get in the upcoming months. So far I have Birchbox and Look Bag and I am interested to compare.